You've got to be careful when you order online, whether your product is coming from the UK, US or China I always recommended having a thorougher check of the size guides, shipping times and so on. Even in the UK you can be stung with an XS dress that is definitely not an XS. With that said, Chicwish is a brand I've never had a problem with-I've always had my parcel delivered through my door in under two weeks-pretty impressive right? As soon as this dress arrived I knew how I would style it. 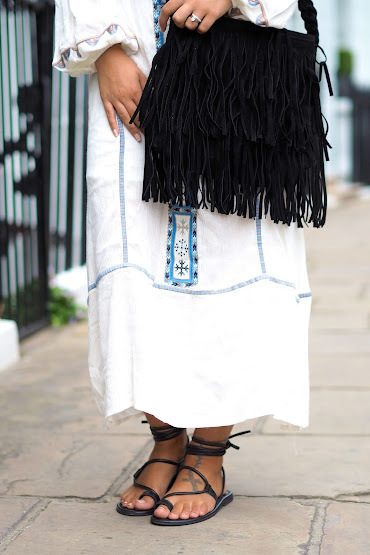 It gives off such a bohemian vibe with it's intricate embroidery-paired with lace up sandals and a fringe bag you wouldn't look out of place at a festival, strolling through the streets of London or simply enjoying a picnic in the park. You can see how I've styled Chicwish other ways, here and here! this dress is lovely on you, such a gorgeous boho look!